The WRT Modular Component Systems (MCS) are designed for various contaminant removal applications from 50 to 250 gallons per minute. 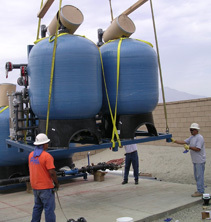 Multiple systems can be installed at a single site to achieve higher flow rates. MCS treatment equipment arrives pre-assembled at the site minimizing onsite construction time. These systems can be provided with complete controls that also allow remote monitoring. Contact us to learn more about WRT’s Skid Systems.